New Hatters keeper Elliot Justham is looking to get his career right on track after signing his first-ever pro deal with Luton Town on Monday, writes Mark Wood. The 22-year-old 6ft 3ins stopper penned a two-year contract after agreeing to move from Ryman League side East Thurrock United. Justham has spent the last four years playing senior non-league football, while working nights on the London Underground doing track maintenance. Having moved into men’s football from Hornchurch Youth he has played over 150 times for the likes of Waltham Forest, Leighton, Redbridge, Brentwood and East Thurrock in the last four years. Last season he kept 14 clean sheets in 31 matches as he helped the Rocks to the play-offs and, although Luton had been keeping an eye on him, the move still came as a surprise. 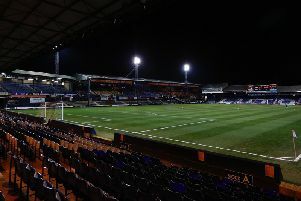 For more, see the Luton News/Dunstable Gazette on sale now, while for all the latest Luton Town FC news, reports, stats, player profiles, live match updates, MOM poll, prediction table and a complete fixture list, visit our Hatters Microsite.